Just discovered this little animation, the text is in Russian but is totally unnecessary. I was giving this as an answer before as some more modern models were jumping the rails, when older models didnt. It was not down to the flanges, but the lack of angled profile on the treads of the wheels. The angled profile makes the body of the vehicle lean in towards the centre of the curve. Today's more flatter profile wheels may be more true to scale, but the way things react when you scale them down makes you need more of an angled profile to compensate for this. If you made pairs of wheels in a lathe with completely flat profiles with 90° angles to the flange, and fit them to a wagon or coach and give them a try, they won't stay on the track. It would have nothing much to do with the flange depth, as one would need a really deep flange to keep them on the rails. Try an old Hornby Mk2 coach with silver seal wheels. These wheels have quite an angled profile to them and they really work well. (The round axled ones work better. The square axled ones tend to have out of true issues where they wobble). It shows the rails angled inward, I am not sure that is true! Many years ago I answered an exam question to develop the equations to calculate the super-elevation required for a train to safely pass through a curve at a particular speed. ... strange the things you remember. Edit: Well some research suggests canting the rails inwards is quite common, it presents an effectively parallel running surface to the taper of the wheel, thus reducing stress. The wheel/rail interface is a tremendously complex science, I think that it is a branch of Tribology. 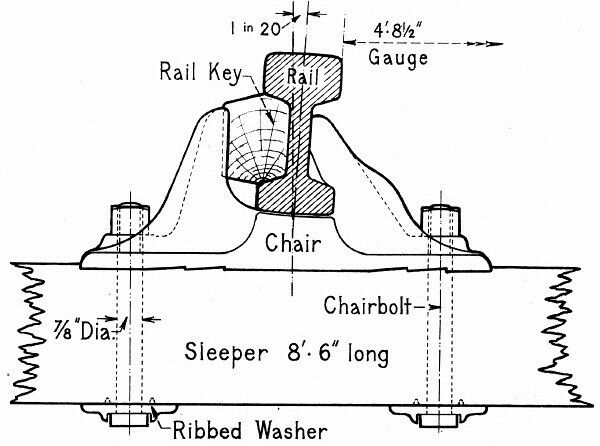 The profile of the wheel and flange has been developed to maximise ride quality and also to minimise flange contact with the rail which is undesirable in that it causes noise (flange squeal) but also is very inefficient as the flange rubs against the rail instead of rolling on it which causes drag due to friction. Many lines with sharp curves will have flange lubricators fitted at the entry to the curve so that grease is applied to the flange to reduce the friction. Probably a simple answer to this question, but I am blowed if I can work it out. On a curve wouldn't the outside wheels have further to travel than the inside wheels? would be travelling two different distances? ps. on cars we have a diff. Real railway rails do have a slight inward angle. Standard gauge used to be 4' 8" and broad gauge used to be dead on 7'. As speeds increased, to help trains on corners an extra half inch was needed in the gauge width, so this is where we get the odd measurement of 4'8½" from. Broad gauge was also slightly increased by the same ½". railwayjim wrote: On a curve wouldn't the outside wheels have further to travel than the inside wheels? would be travelling two different distances? ps. on cars we have a diff. It works in model form too, which is why coned tyres are more free rolling than flat tyres, and most noticeably so on curves. Mountain wrote: Real railway rails do have a slight inward angle. Just a minor correction: the GWR broad gauge was 7 foot and a quarter inch. Talking of coned wheels, Queensland Railways was one of very few in the world that used cylindrical wheels (i.e. the treads weren't coned), and had vertical rather than inclined rails. I can't remember off the top of my head when this changed, but it was possibly the 1970s or '80s (but don't quote me on that). It was a relatively recent occurrence, anyway. QR's gauge was, and still is, 3' 6" for all but the standard gauge interstate line running from Brisbane to the border with New South Wales, which was operated by the New South Wales Government Railways but owned by the Queensland government (extended to the Port of Brisbane in recent decades) - all of this before privatisation muddied the waters a bit. Interestingly enough, when London Transport ran "handed" trains in earlier years, the trains all had to face one direction so that they could be coupled together with the correct auto-coupler electrical and air connections, which meant that trains on the Circle Line always had the same wheels on the inside of the curves. It was a very real problem in the outer wheels wearing down more quickly than the inner wheels. There were other problems caused by the "handedness" of the trains too: when the O and P stocks were run on the Circle Line as well as the District and Metropolitan Lines, it meant that if all O and P west-facing driving coaches were 'A' end cars, and east-facing driving cars were 'D' cars, coupling could occur between units (A cars could couple to D cars, but A to A or D to D were incompatible), which in turn meant that the Circle Line trains ended up with A cars facing east and D cars facing west at the "top" of the Circle Line, thus being the wrong way round to couple with Metropolitan trains of the same type in an emergency. The solution was to turn the entire stock of Metropolitan Line allocation. I seem to recall reading that the auto-couplers had 23 connections, whereas for reversible coupling ability, they would have needed at least double that number. In all more modern stock, the auto-couplers are symmetrical, allowing A or D end cars to couple indiscriminately. What it's easy to forget when thinking about this, is that railway curves have enormous radii when compared to model railways, This means that the difference in the length around the curve is easily compensated by allowing the wheel set to ride up on the inclined surface of the rails, an incline which can if necessary be extended by applying superelevation (cant) to the track, which is the only time these measures are readily visible to the casual observer. A favourite (decidedly unhealthy) play area when I was young was the footpath and bridge alongside the river Tame (at the time Europe's most polluted) and the old South Staffs line from Bescot into Walsall, Where the river passed beneath the 180 degree curve that went out towards Wednesbury there was a second span alongside the river crossing to act as a floodplane, from where those sufficiently daring could climb into the girders and stick their heads up between the rails. The cant was very noticeable at that point, even though the line was mainly used by "Super Ds" crawling round with long rakes of usually empty 16t minerals., and the flanges still screamed the whole way round. Mountain wrote: Standard gauge used to be 4' 8". As speeds increased, to help trains on corners an extra half inch was needed in the gauge width, so this is where we get the odd measurement of 4'8½" from. Can you show your evidence for that, Mountain, I can find no reference to it in anything I've read, all say 4ft 8.5ins from the start. George Stephenson used the 4 ft ​8 1⁄2 in gauge (including a belated extra ​1⁄2 in (12.7 mm) of free movement to reduce binding on curves) for the Liverpool and Manchester Railway, authorised in 1826 and opened 30 September 1830. Thanks, Jim, interesting as it just relates to the actual gauge and would seem to have been applied to the whole line. It would seem that was the easier option back in the day rather than pushing the wheels in on the axles... Which, unless I'm mistaken (again!) is not quite the same thing as "gauge widening" where the gauge is just widened on some curves and other locations to ease transit but the line as a whole is still the standard gauge... The reason is the same but the widening is not a uniform 1/2" as on Stephenson's original line.